Who: Lifeinaclick’s staff of 1 cooperating with Coca-Cola team on the entire activation but focusing only on the photo activity. In few occasions Inventa staff trained by Lifeinaclick did the photo activity when it was required in different locations at the same time. What: Lifeinaclick provided cameras, barcode scanners, barcodes and the web platform hosting the website, the photo galleries and the software matching the pictures with the codes in possession of the customers. 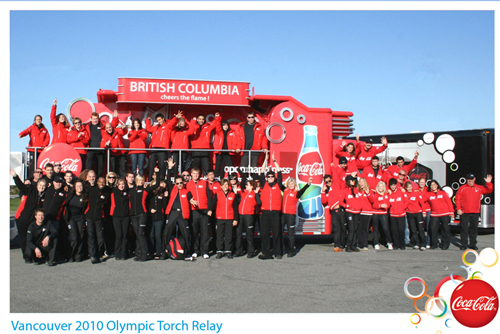 How: People visiting the Coca-Cola tent and RV could have their picture taken with the real Vancouver 2010 Olympic Torch. The photographer had then to scan a flyer with barcode and hand it out the photographs subject. Using the code written on the card the customer could downloads its pictures for free from Coca-Cola’s website. It was up to the photographer to upload the pictures on Lifeinaclick’s ftp each day after activation.